Our Halloween outdoor lighting displays are the cat’s meow. Imagine this eager ghost welcoming your trick-or-treaters this Halloween. This time of the year is indeed my favorite. The trees are putting on their show of fall foliage, chunky pumpkins are ready for carving, and the fall apples are ripe for the picking. Along with all the wonderful things fall has in favor, Halloween is just a scream. Homeowners are gathering their hay bales and other seasonal decor and preparing their homes for the most spooktacular time of the year. 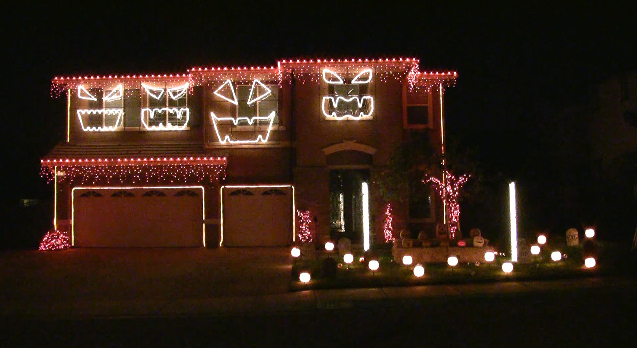 Halloween outdoor lighting is quickly becoming a hot commodity in the outdoor lighting genre. Our custom Halloween lighting is just as effective in conveying the spirit of the season as our Christmas outdoor lighting. We offer a wide range of hauntingly beautiful colored lights ranging from orange, to mad scientist green. We also have a wide selection of Halloween icons such as pumpkins and black cats to take your Halloween decor to a new level this season. 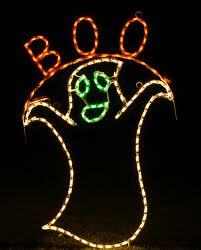 We can create a Halloween lighting display that will make you the host with the most. Along with creating a display interesting enough to stop traffic, Halloween lighting will also add in safety in getting those adorable trick-or-treaters to and from your door. Imagine lining your walkway with an illuminated path that is frightful and delightful! Our Halloween is also the perfect way to liven up your autumn party. Your lighted display will put your guests in the mood and offer them a sample of the goodies awaiting them on the inside of your home. 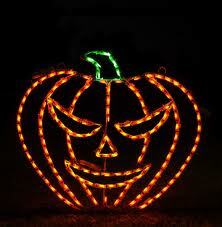 We have many beloved icons available for your Halloween lighting display. If you are thinking that a little Halloween outdoor lighting may just hit the spot this season, contact Outdoor Lighting Perspectives of Nashville to get started. We can take your yard from blah to” boo-tiful” guaranteed. See more breathtaking examples of holiday lighting ideas by visiting our holiday outdoor lighting gallery located on our website. This entry was posted in Halloween outdoor lighting, Nashville Holiday Lighting and tagged landscape themes, LED holiday lighting Nashville, lighting design, Nashville Halloween icons lighting, Nashville TN Halloween outdoor decorating, Nashville TN Halloween outdoor lighting, Nashville TN Halloween themed outdoor lights, outdoor lighting Nashville, outdoor lighting perspectives by outdoorlightingnashville. Bookmark the permalink.